KeppenArt announced this week that they are Going To The Dogs. That is the name of their new campaign to help raise money for life saving surgeries and treatments for shelter animals in the Lauderdate County, Florence, AL area. 100% of KeppenArt’s mark-up on eligible purchases will be donated to Chloe’s Fund. That is a fund started by Glenn and Debby Nelson of Florence, AL in honor of their beloved pet Chloe. Shelter animals that need expensive surgeries or treatments rely on that fund. Without it many of these adoptable animals would otherwise be euthanized. KeppenArt has over two dozen images and hundreds of product and color choices that are eligible for this campaign. Check out the Going To The Dogs Collection on keppenart.com and choose your print or product. You will not only be purchasing a unique item but will also be helping to save a shelter animal’s life. In November 2017 Kathy K. McClellan of KeppenArt was asked to join the online team at Our Arts Magazine. She was asked to supply the topics for the magazines Writing Skills Task, an activity to hone one's writing skills by writing a short piece each and every day. Kathy had already participated in a few of the tasks and had two short pieces published in the magazine before she was asked to join the writers team. She is honored and excited about her new position and looks forward to a creative year ahead. Kathy K. McClellan, the artistic photographer at KeppenArt, LLC has just announced that 100% of all profits from keppenart.com generated from now till December 31st will be donated to two families who have lost everything in the recent historic flooding in Louisiana. Kathy has been in contact with a personal friend in Baton Rouge who located there after losing everything in Hurricane Katrina. Her friend's nephew and niece have now lost everything in Louisiana's flooding. Kathy decided that this was one way she could pay back some of the help that she and her husband received from individuals after they themselves lost everything in Katrina. It is that time of year again for Cruisin' The Coast. That's when thousands of antique vehicles and old car enthusiasts gather on the Mississippi Gulf Coast. Local photographer Kathy K. McClellan of KeppenArt will be displaying her artwork again this year during the festivities. Kathy has been helping out at The Starfish Cafe on Main Street in Bay Saint Louis. This year she will be in front of the cafe where visitors may purchase some of her work. We urge everyone who attends the festivities this year to enjoy the beautiful weather and scenery and to check out Kathy's artwork . KeppenArt announced recently that several works by local photographer Kathy K. McClellan would be available exclusively at Bay Life on Main Street, Bay Saint Louis, MS. Located in the Old Town area next to the municipal harbor, Bay Life is "The Shop for Bay Coastal Style". Kathy's local images that are presently being offered are printed on aluminum for a striking, unique look. More images and various mediums may be added in the future. It is that time of year again for Cruisin' The Coast. That's when thousands of antique vehicles and old car enthusiasts gather on the Mississippi Gulf Coast . 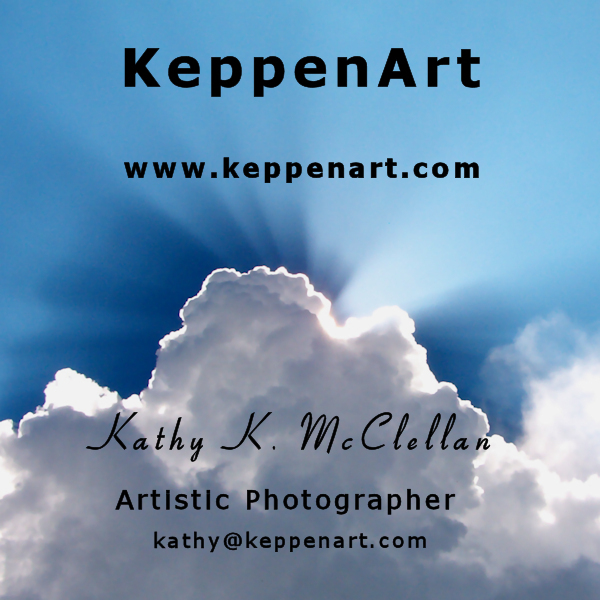 Local photographer Kathy K. McClellan of KeppenArt will be displaying some of her artwork this year during the festivities. Kathy has been helping out at The Starfish Cafe (an outreach program of PNEUMA Winds of Hope, Inc.) on Main Street in Bay Saint Louis and will be on hand this week-end at the cafe where visitors may purchase some of her work. The photographs available at the cafe include prints on acrylic, canvas and metal. We urge everyone who attends the festivities this week to enjoy the beautiful weather and scenery and to check out Kathy's artwork. Photographer Kathy K. McClellan was recently a Featured Artist on weebly.com. Cathy Jourdan has been graciously featuring a different artist every day and she chose to feature Kathy K. McClellan on Sept. 17, 2014. You can read Kathy's biography, view a few examples of her work and follow links to purchase prints, greeting cards and cell phone cases all from the feature page at http://featuredartists.weebly.com/blog/kathy-mcclellan-photographer . Local Free Lance Photographer, Kathy McClellan wears her photographer's hat when she is quietly basking in the beauty of God's Creation. At other times she wears a Realtor�'s hat. Recently while wearing her Realtor� hat , she joined the team at Mississippi Coast Realty in Pass Christian, MS. She can now offer two services to assist people on the Mississippi Gulf Coast. She can help you find that perfect home and then help you decorate the walls of that home with scenes of the local landscape. Be sure and e-mail Kathy for any assistance that you need with either or both of these projects. There are new directions for Kathy K. McClellan in 2014. After contemplating an art business for her photography and her sister's paintings and multi-media work (KeppenArt,LLC) she has finally gotten off to a good start by joining Fine Art America. Photographs are being polished and uploaded to her new artist's website (www.keppenart.com) and research has begun for a newer, more advanced camera. There will be many changes and new beginnings in the coming months and Kathy invites everyone to follow her endeavors throughout the coming year.